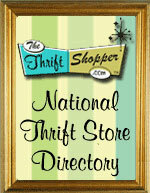 This is the current list of our best thrift store website features. We are constantly working to add to these. If there is something you need, that is not listed here, It can most likely be achieved through our custom work. When you purchase one of our website packages, you will instantly receive a fully functional website (over 40 pages) that is ready to use. Our service doesn't stop there. Below are the best features that you will also receive. Remember, we are constantly working to bring more features and gadgets to you. The ThriftStoreWebsite.Com's services are going to get better! Soon we will be adding a new Photo Gallery and Mobile website! We will be sure to let you know when these roll out! Also for the Profit Package, we will be offering a Catalog for you to have an online store within your website! 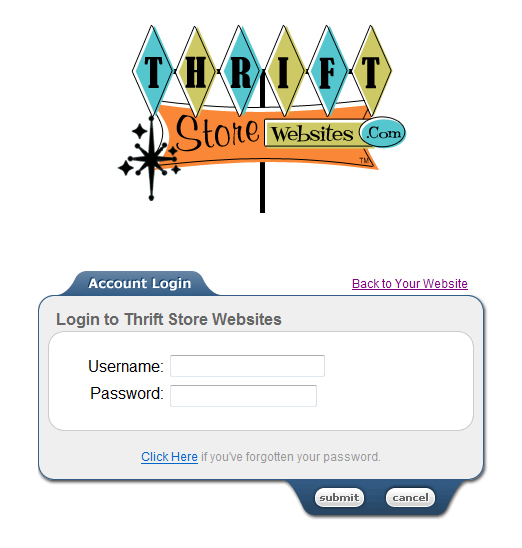 The ThriftStoreWebsite.Com's Site Builder was created specifically to make web design and updating easy for the end user (you) to use. If you can use Microsoft Word, then this site builder will be easy for you. Most of our features can be accomplished with a couple clicks of the mouse, and typing a few words. We are sure that you will be amazed at what you will receive after purchasing a website package. Our pre-built websites are literally ready to use. When you first log into your website you will notice that it will already be customized for you, with over 40 pages. Your business information will automatically be loaded through out the website. With tons of content loaded into your site there will not be much work left for you to do. With couple clicks of the mouse you can change the look of your entire website. We have lots of templates to choose from. Our templates are entirely created by us, each with a thrift store theme. These are not cookie cutter templates. Each template is professional looking, and has many color schemes and pictures to choose from. We are constantly adding new templates! Once you sign up our Thrifty World News Feed will automatically be installed on your website. This news is updated several times daily. It is all Thrift Store related news. Your visitors will be more likely come back to your site in order to keep up with the latest happenings in the Thrift Store World. Offer a Thrift Tool Bar to your customers! This tool bar is packed with great tools to keep customers or even yourself up to date with what is going on in the thrift world! After signing up, our software will automatically generate a page in your site with a full interactive Google map to your store. 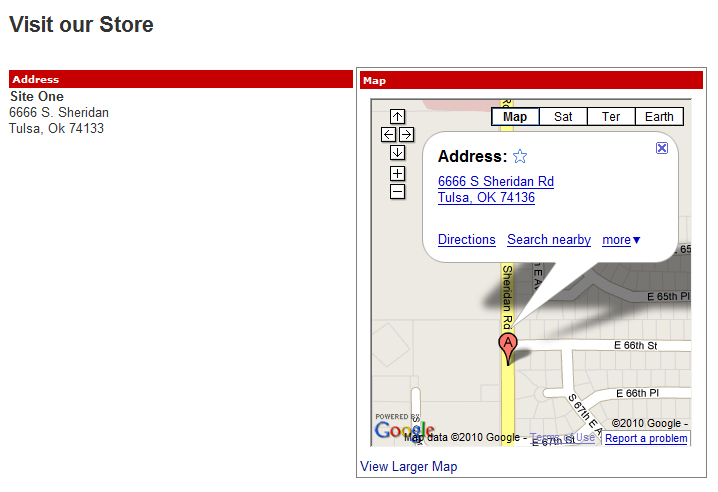 Your visitors will be able to find the easiest route to your store from their house. A very useful tool for your visitors that find you online. Our service gets you 100% internet ready, however if you have a specific need that is not covered, we offer custom services. Here, your visions can become reality. Our team of designers can do everything from changing template colors to Flash entry pages and everything in between. ThriftStoreWebsites.Com wants you to be successful. We offer several forms of support. Our Help Site is very useful. It is jam packed with step-by-step tutorials on almost all the features of our website packages. These tutorials are complete, with illustrations. If you need more than that, we also offer "Live Chat," Email, and Phone support. SEO stands for "Search Engine Optimization." This is important to get your site found easily through google, yahoo, etc. Your website will automatically be ready for search engines. We will put key information (specific to your thrift store) into your website meta-tags. You will always be able to add to this at anytime. When you sign up you will automatically receive 2 hours of custom work. All you have to do is fill out the "2 hours of free custom work form." Our design team can do quite a bit in 2 hours. This is normally a $50/hour service. Don't forget to take advantage of this offer. This FREE service can be requested once your billing information is updated. Use this form to request it. We provide you with several tools to make your website successful and useful for your visitors. We want to make sure that new customers can find you and repeat visitors have a reason to keep coming back to your site. And More! (Remember you will get over 40 pages already full of useful information relevant to the thrift industry.